Adorable 1995 ornament from Enesco called "get in the spirit... Recycle". 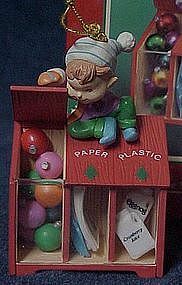 A little elf sits atop a recycle bin. Very cute! comes in original box and packaging. Box top has been torn but ornament is like new.